The Klinger Reflex Water Level Gauge was featured on later Locomobile steam cars. 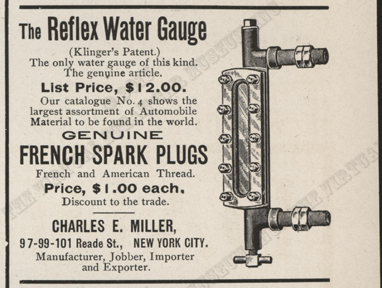 Charles E. Miller of New York City offered the Klinger Reflex Water Gauge in this September 11, 1902 Motor World advertisement. Contact us if you have additional information about the Klinger Reflex Water Level Gauge or if you have questions.